This program will sponsor science students to participate in conservation projects under the University Student Sponsorship Programme in Wildlife Conservation (USSP) 2015/16. Check out the details on mySCI! Check out our coffee week in October! MenTernship Program targets junior students who would like to explore more and plan their future, the School of Science has invited 12 celebrities from different sectors to be our prestigious mentors this year! 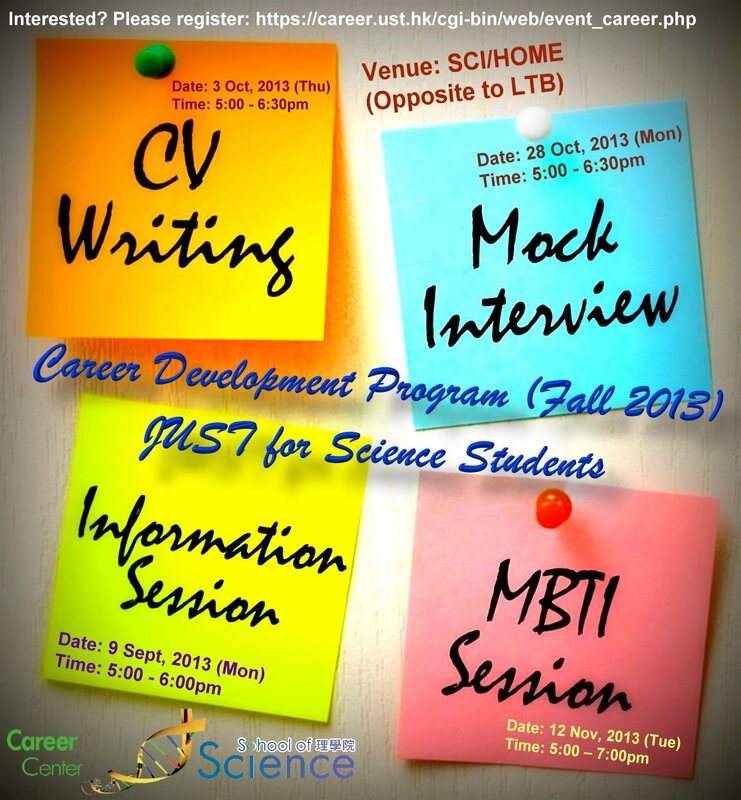 Join this program designed exclusively for science students to gear up for your future! Prof. Wei-Ping Li will introduce to you the history of mathematics through a walk to the new gallery at the MATH department. Starting from 2 Oct, one physics topic will be presented every Friday at 7-8pm. Join this program to find a language buddy! Find out more about your major! Join our Workshop and learn how to write Red Banner! Come and Join us on 13th Feb 6pm! Enjoy your last day of Fall Term! Join us to learn more about each major! How to become a Seeing Eye Dog Trainer/ Guide Dog Mobility Instructor? SCI-LUNCH: Can Renewable Energy Save the World? Enjoy the yummy dim sum and learn cantonese! Science Music Band PARTICLES is recruiting new members! We need guitar, keyboard, drum, vocal, etc. 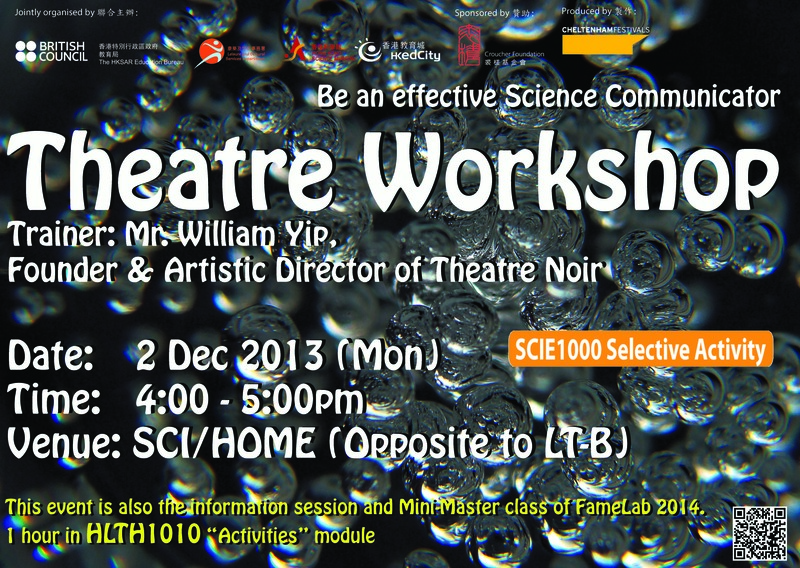 Go to mySCI and sign up! Knowledge Without Border Seminar Series (31st) - Future Political Leaders: In the Eyes of Hong Kong’s “Iron Lady” (Sep 25). Career Trainging and Internship Program 2014/15 is Open for Application! 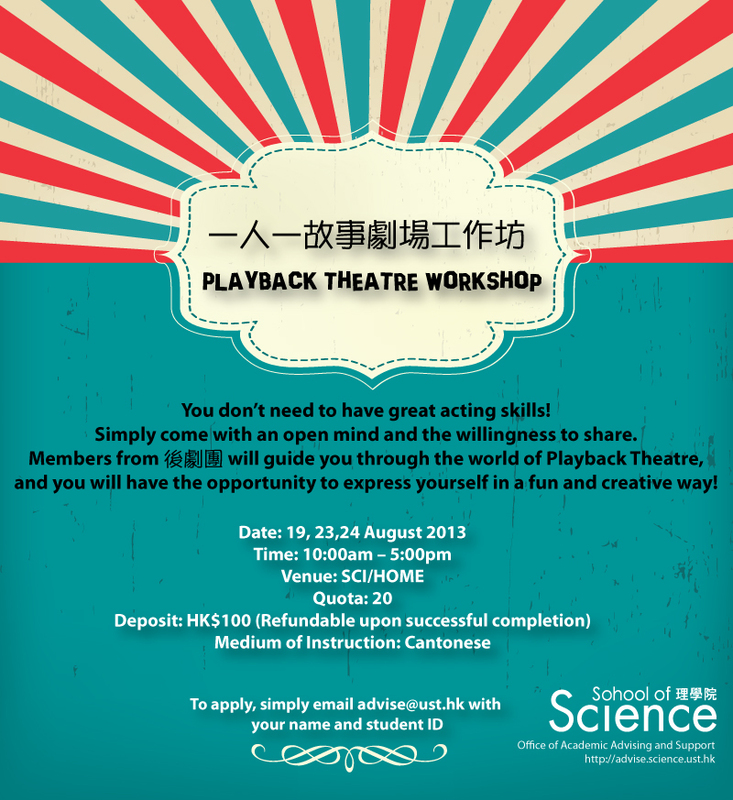 Join us and learn to make your own moon cake! Join our welcome party for all freshmen! Congratulations to our Peer Mentor of the Year 2013-14 - Marco Chan! SCI-LUNCH: How to keep your skin young forever? 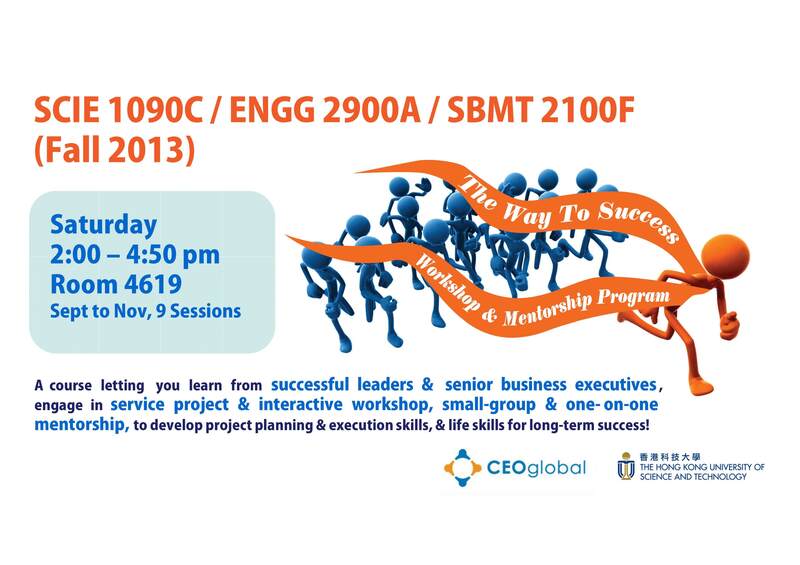 Missed our Info Session? Click here to view the presentation slides. SCI-LUNCH: Is lab-grown meat the future? Join us to know more about each major! MenTernship program 2014 is back! 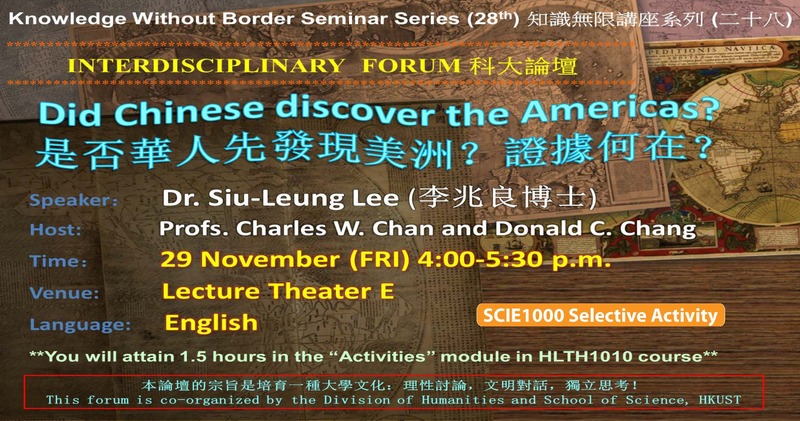 Knowledge Without Border Seminar Series(28th): Did Chinese discover the Americas? No registration is required. Seats are limited, first-come-first-served. You will learn more about each Science Major in the Science Majors Week from 28 Oct to 1 Nov. Click here to have details of activities and schedule. Free Coffee Friday is BACK! Time for a break! Join us at 3:30 this friday! 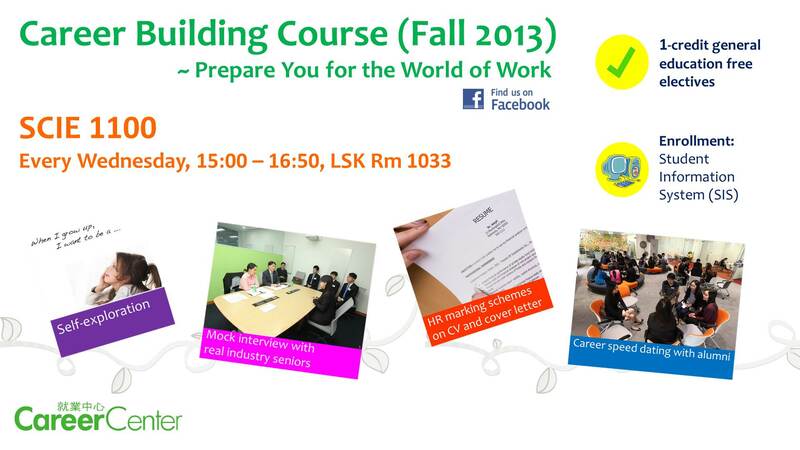 Read more about the courses/program that will prepare you for your future career! Join our Career Development Program (Information Session, CV Writing,Mock Interview & MBTI Session) offered by Career Center! For course details, please refer to here. Get a free umbrella to celebrate the start of the new academic year and our newly named office "SCI/HOME"!! Our FIRST Edition of SCI/HOME Journal is Ready! PARTICLES is formed by a group of passionate science students. Hoping to share the joy of music to HKUST! 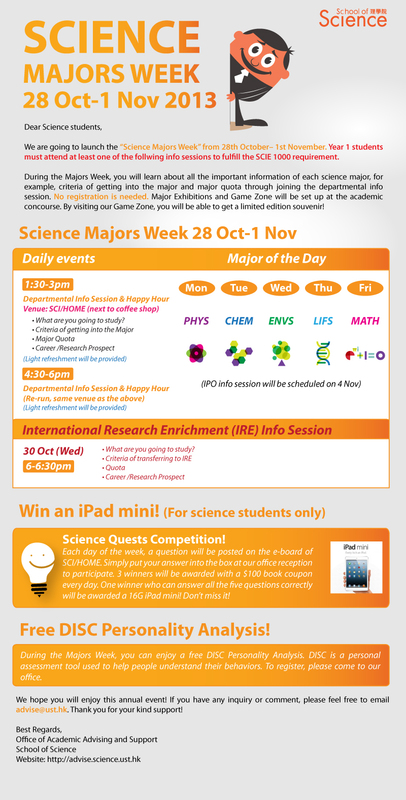 You will learn more about each Science Major in the Science Majors Week from 28 Oct to 1 Nov. Click here to view the details of activities and schedule. Go Science Luncheon was held from 26th-30th Aug 2013. Through this casual gathering, freshmen has the chance to meet other new students and Peer Mentor! MAGNET Party organized by our peer mentors to welcome our new students!!! Free coffee/tea was served every Friday in Spring Term. All science Faculty, staff and students were invited to gather at SCI/HOME and enjoy a relaxing afternoon! Our Slow Music Concert featuring Jim Lau (Hong Kong Famous Songwriter & Singer) and our NEW Science Music Band – PARTICLES. Help us to name our office! Send us your creative idea, and you will have the chance to win $500 coupon!